I recall meeting India on a lovely evening—her mother’s first book launch to be exact. She had a twinkle in her eye, as she excitedly shared plans to soon open up a beautiful shop dedicated to cosmetics. What I didn’t know at the time was that it would become my personal favorite. “I bought my first makeup kit when I was like eight at Walmart and I would give makeovers to anyone who would let me” she recalls. 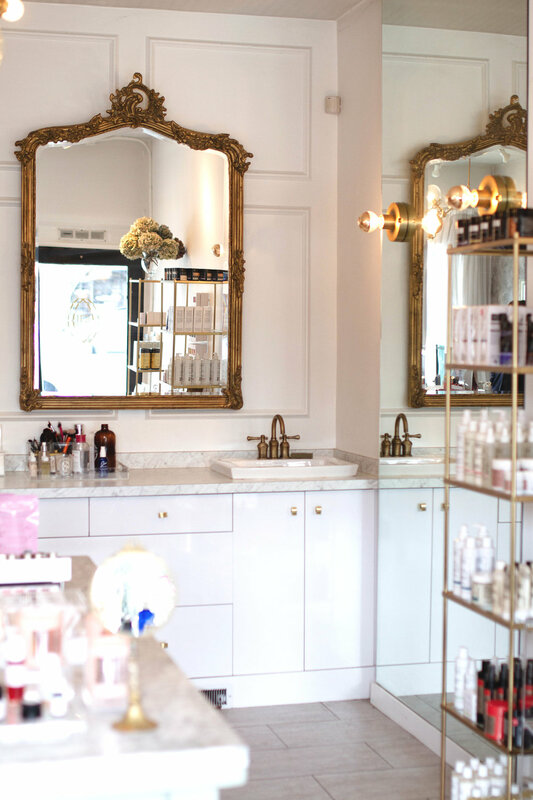 In this jewel box of a 450-square foot shop, one will find a large beautiful landscape that trails across the left side wall, encompassing classic marble countertops, a grand ornate gold-trimmed mirror, (Rodin-inspired) green central cabinetry, charming furniture pieces, and plush details. 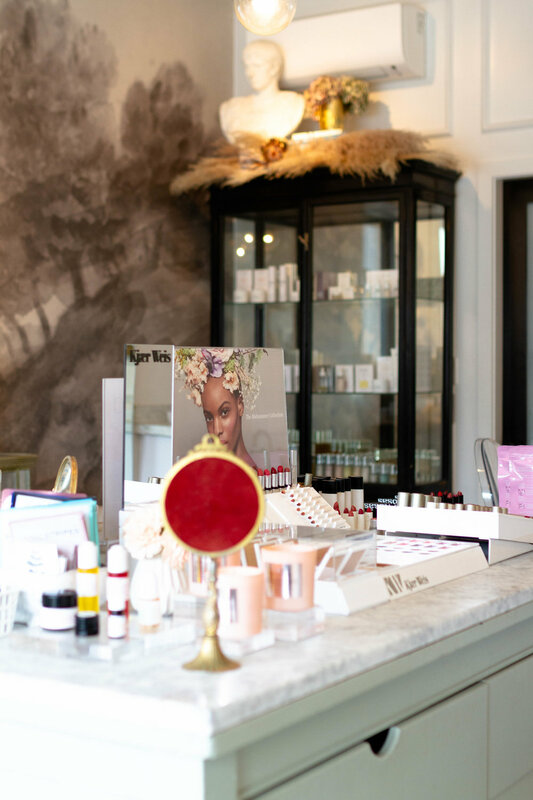 The look and feel of the shop that is unlike any other—particularly in the cosmetic sector—and one that feels inviting and more importantly, special. The product selection is ever-inspiring, and refreshingly, not in the least overwhelming. Indeed, this is because India has done all the work to set up the loveliest selection of classic musts alongside surprises—be it French pharmacy finds collected from a trip to Paris, or Japanese favorites after her recent trip to Japan. Visiting is truly a pleasure, and a reminder of the very joy that resides in shopping personalized boutiques that offer wonderful service, care and unique point of view. I opened IRC just about three years ago, on April 5th of 2016. I have always loved beauty products—long before I opened the store or even before I became a makeup artist, I was always the person who people would come to when they wanted to know the best face cream to buy, the best mascara etc. I was obsessed with reading beauty blogs and sourcing cult beauty products that weren't yet available in Canada. When I was going to UBC, Blanche Macdonald launched a makeup program that was only on weekends. I enrolled in the year-long program to receive formal training to become a makeup artist. Upon graduating from UBC and Blanche, I decided that I wanted to create a space where I could do makeup and sell the products I love, that I had always recommended to my friends and family to buy. No. 02 India Rose is a beautiful store. What brought together the look and feel of the space? Thank you! I think the initial inspiration started with my Tumblr page, which was basically just one big collage of Parisian apartments I love. I showed the page to my mom and she took it from there. It's a small space, so we wanted it to have the essence of a beautiful French apartment that feels special yet inviting. I wanted people to be able to feel like they can hang out here but to not be intimidated to come on in. No. 03 What is your approach to selecting brands to work with? And the items that you bring in? So first off, everything in our store is cruelty-free, meaning that no product we sell has been tested on animals. The majority of products we sell fall somewhere on the "clean beauty" spectrum, a term which has yet to be defined by the FDA. Some lines are food grade, some are organic, some are wildcrafted, some are vegan, some are made in a lab using plant-derived chemical compounds. The important thing is that none of the products we sell will hurt you in any way. When it comes to selecting lines, I like to carry products that either I actually use and love, or products by brands who inspire me through integrity, innovation and a commitment to the environment and who might not be well-represented in Vancouver or maybe even in all of Canada. My mom inspires me every day—she is an entrepreneur, writer and all around creative genius. She is the hardest working person I know. In terms of inspiration in the beauty/fashion realm, I would probably say the seemingly hundreds (probably more like 15) cool Danish girls I follow on Instagram who are really mastering that polished, glowy no-makeup makeup look that I love and replicate in the makeup that I do on myself and others. Cocofloss! A natural dental floss made of coconut oil and coconut fibers. It feels like a loofa for your teeth and your teeth feel so clean afterward. It is truly addictive. I love to floss now. A few additional tips: We love her “mystery bag” —perfectly wrapped in the IR signature bag and ribbon. It’s $50.00 worth of surprise treats—perhaps a great idea for an upcoming present. India also offers: makeup application, makeup lessons (redeemable in product), makeup service on location for an additional fee, and of course, bridal makeup. Also, if you have a cup of coffee in hand, be sure to visit her blog.